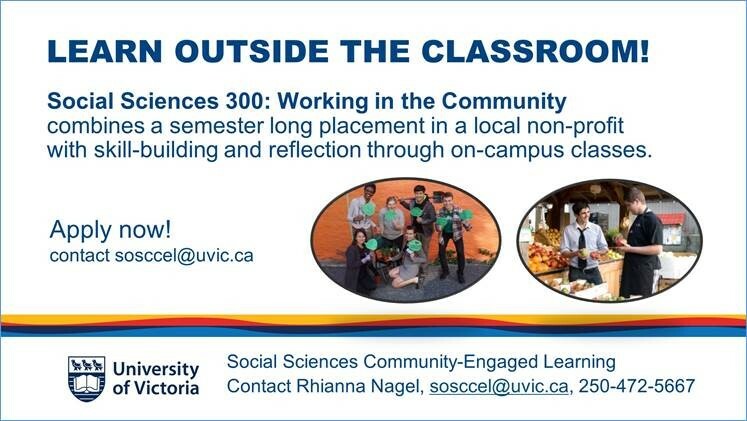 Social Sciences 300: Working in the Community Apply now! Introduction to the symptoms and sources of environmental problems and approaches to resolving them. Students will apply their understanding through a distinctive interdisciplinary exploration of three main themes: ecological restoration (the process of assisting the recovery of an ecosystem that has been degraded, damaged or destroyed), political ecology (the theory and practice behind sustainability) and ethnoecology (the study of the relationship between people and their habitats). For more information please see the UVic calendar. An introduction to the discipline of ecology with a focus on understanding biotic processes as they relate to contemporary environmental challenges. Laboratories emphasize methodologies for the generation, analysis and application of data. Conducted in relation to work or volunteer activities with a host organization identified by the student and approved by the RNS Academic Administrator or the Director of the School of Environmental Studies. Student will engage in experiential learning and assessment of methods in ecological restoration in an applied setting. Student will work with an instructor to identify issues to be explored and what course assessment methods will be used before the experiential learning opportunity begins. Must include at least 150 hours of work or volunteer activities. Assessment typically involves a reflective journal and final paper. Students are responsible for proposing an internship and arranging for a supervising instructor. Permission of department required for registration in this section. A field-based introduction to environmental problems and solutions, such as assessing stream function and proposing enhancements to improve water quality and riparian areas. Typically offered in a compressed format. Additional fees may be necessary to support field expenses. Prerequisites: 240 or BIOL 215, 200, or 300A. This course introduces the various socio-political and philosophical issues associated with the concept of a sustainable society. Emphasis is placed on the analysis of the complex relationships between social and biophysical systems. In turn, this course will examine how communities and environments are being impacted by the globalization of economies and cultures, technologies and ideologies, as well as responses from a variety of local, non-governmental and international agencies. Examines how the global capitalist economy is transforming ecosystems, and how social and environmental challenges are in turn beginning to transform capitalism. Economic alternatives will be examined in local and global contexts (e.g. the social economy, steady state economies, and indigenous economic practices). An introduction to the economic analysis of environmental problems. In particular, an examination of policy interventions in cases where market activities result in socially undesirable impacts on the environment. Topics typically include: externalities; pollution control policy; climate change; public goods; time, uncertainty and the environment; and trade and the environment. Prerequisites: ECON 103 or ECON 201, and ECON 225. A philosophical investigation of the moral and conceptual dimensions of environmental problems. Different philosophies of the relation between humans and nature will be compared. Some of the topics to be examined are: human wants and human satisfactions; nature and spiritual values; community; human obligations to other animals; defining quality of life. Prerequisites: Third or fourth-year standing, or permission of the instructor. Diversity of organisms, functioning of ecosystems, and the impact of human activities on these. Topics include the nature of biological diversity; extinction and its causes; habitat alteration and fragmentation; effects of exotic species; economic and ethical considerations; practical applications and analytical tools; and legal frameworks for conserving species and habitats. Prerequisites: Completion of Biology core including STAT corequisites, or for students other than Biology majors BIOL 190A (or 210), 215, 230 and STAT 255 or 260. Environmental knowledge systems of indigenous and other local peoples are increasingly recognized as having relevance in understanding and documenting biological diversity and conservation and in undertaking ecological restoration. The different aspects of local and traditional ecological knowledge and their relationships to western academic knowledge are reviewed and the issues and requirements for applying local knowledge in environmental sustainability are explored. This course examines how effective restoration depends on both ecological and cultural awareness, including the physical, chemical and biological characteristics of ecosystems from local to global scales; the impacts of human-induced change; the philosophical and ethical context for good restoration; the need for and significance of community involvement; the legal and policy frameworks that direct and influence restoration activities; and the importance of understanding essential ecosystem characteristics in restoration. Students in ES 341 work in small groups on restoration design projects focused on UVic and beyond. The final reports are available below. An introduction to experimental and statistical ecology, including principles of experimental design and sampling methods and data analysis. Prerequisites: STAT 255 or 260. Study of biological organisms and ecosystems with particular reference to mechanisms of change and human impacts on the environment. Will focus on: biodiversity (definition, assessment methods, loss, and evaluation); population biology (concepts and research methods); habitat loss; species extinction; exotic species and their impacts; and possibilities for human intervention in alleviating trends in species loss and ecosystem degradation. Prerequisites: BIOL 190A and 190B or equivalent, ES 200 or 300A. An overview of British Columbia's globally significant biodiversity. We will examine species distribution patterns, use, and conservation, including academic and government research and management. Lectures and field trips will include synthesis of patterns of biodiversity, management success and failure, and future biodiversity conservation and use in BC. Course goals include developing a deep understanding of the patterns of biodiversity in BC, explaining the reasons for these patterns, and identifying numerous species and their importance. Prerequisites: 200; and 240 or BIOL 215. A survey of the climate system and its interaction with past, present, and future societies. Topics include: climate change and the onset of agriculture/domestication, climate change and the rise and fall of early civilizations, the anthropocene and global warming. The interplay between science, media, public relations and public policy will also be addressed. Note: Credit will be granted for only one of ES 365 and EOS 365. Prerequisites: 200 or 300A and at least third-year standing; if taken as EOS 365, at least third-year standing. Further field-based study of environmental problems and solutions, such as integrating watershed scale analysis and enhancements. Typically offered in a compressed format. Additional fees may be necessary to support field expenses. Prerequisites: 200 or 300A, 270. Builds the skills necessary to lead effective change in community-engaged settings. Emphasis on personal and group communication skills, decision-making techniques, presentation and facilitation skills, ethics and self-awareness for leadership. Includes case studies, examinations of theories of leadership and social movements, and practical experience. An in-depth systematic examination of specific environmental areas through seminars and projects; the development of appropriate responses to questions and problems within the selected areas; modes of interaction and communication with professional and community groups; application of theory to practice; qualitative vs. quantitative research methods. This course will be conducted as a seminar and may include a field trip for which a fee will be charged. Note: Credit will be granted for only one of 381, 300B unless approved by the Director. May be taken more than once for credit in different topics to a maximum of 3 units. Enables each participant to grasp the fundamental principles of systems theory, and provides a foundation for further exploration and application of systems concepts. Examines concepts such as cybernetics, holism, boundaries, negative and positive feedback, self-organization, and transformation. Students will learn to apply these principles to both natural and social systems. Note: Credit will be granted for only one of 384, 414, 400D (if 400D taken prior to 1989-90). Prerequisites: 200 or 300A, and one of 301, 321 or 341. Builds the skills necessary to critically assess environmental issues and research. Emphasis will be placed on critical assessment of evidence of all kinds, grounded in an understanding of quantitative and qualitative methodological considerations. Students will evaluate a wide variety of approaches to understanding and addressing real-world environmental challenges, and work towards producing their own compelling and comprehensive analysis of these challenges. Prerequisites: All of ES 200, ES 240, third year standing. Analyzes the structure of law, policy, and sustainability in a particular geographic region. Review of overlapping jurisdictional and governance systems that shape a region. Note: Credit will be granted for only one of 403, LAW 384, LAW 343 if taken in the same topic. A seminar examining classic works and persistent themes in North American environmental thought. A study of primary source material and texts by writers such as Thoreau, Austin, Muir, Pinchot, Leopold, Carson, Ellul, Schumacher, Berry, and Shiva. Prerequisites: 200 or 300A, and 301. Focuses on developing the knowledge and skills necessary to evaluate how we might reshape energy systems to address the dual challenges of climate change and sustainability. Note: Credit will be granted for only one of 405, 480 (if 480 taken Spring 2005, Spring 2006, Fall 2008. A consideration of the many forms of economic activity that go on outside competitive, profit-maximizing markets. The concept of 'social enterprise' is examined, with ways that communities, and not just individuals, develop their economies with goals of community benefit and social justice as well as material improvement. 'The economy' is treated as a landscape of different practices that may be obscured by concentrating just on market transactions. Prerequisites: ES 200 and ES 301. Examines how mindfulness training, particularly meditation, is being integrated into contemporary environmental and social change efforts. Current research on the physical, psychological, ecological and social benefits of mindfulness training will be examined. Students will be introduced to a variety of meditative practices as part of the course. Note: Credit will be granted for only one of 407, 480 (if taken in the same topic). Explores the terrain of visual media that inform environmental studies in B.C. and internationally. Environmental movements and media campaigns; the visuality of place; art and activism; indigenous new media; representations and relations with non-human animals. Critically examines the politics of looking. Develops and puts into action student skills towards a current environmental issue. Training in working with the media, First Nations, and non-governmental organizations. Analyzes the role and impact of environmental policy actors. For more information please see UVic calendar. The history and philosophy of integral systems theory and its application at the individual and community level. Recent trends in light of panarchy theory and integral ecology. Prerequisites: 200, 301; 384 or 414. Explores how environmental politics is shaped by and seek to challenge relations of oppression. A seminar that addresses a theoretical basis for environmental law and policy; individual research, presentation and contribution to a collected work on the theme is required. Open to upper year students in the Faculty of Law and students with at least fourth-year standing in the Environmental Studies Program. Prerequisites: For ES students: 200 or 300A, and 301. An introduction to the study of the relationship between plants and human cultures, with a focus on the indigenous peoples and environments of northwestern North America. Use of plants as foods, materials and medicines, plant nomenclature and folk classification, and the role of plants in religion and mythology are topics covered. There will be one or more field trips. Prerequisites: 300A or 200 and 321. The role of traditional ecological knowledge in the understanding and documentation of the biodiversity of natural systems and their restoration. Examination of how restoration strategies can benefit from the close relationship of Indigenous Peoples to their local environments, and from their knowledge of plants and animals, their habitats and ecological interrelationships, as well as from traditional land and resource management strategies. Prerequisites: 200 or 300A, and 321. A survey of flowering plants, including morphological diversity and adaptations; plant evolution and species concepts; modern classification; nomenclature; identification and keys; and experimental approaces to the study of plant diversity. Lab projects include at least 1 collection of 10 properly prepared and identified plants, preferably made during the previous summer. Contact instructor for details and collecting equipment. Notes: Credit will be granted for only one of 425, BIOL 449, 318. Prerequisites: BIOL 190A, 190B, third-or fourth-year standing. Introduces students to the essential concepts and methods used by historians, archaeologists, anthropologists, geographers and others to analyze environmental change from prehistoric to modern times. Explores how cultural encounters between Euro-American and the Indigenous peoples of British Columbia played out on the physical landscape, focusing on the processes of dispossession and repossession that led to the creation of the space that became British Columbia. Note: Credit will be granted for only one of 427, 481 (if 481 taken in Spring 2005, Spring 2006, Fall 2007, Fall 2009, Fall 2010. Cultural understandings of ecosystems and knowledge of interactions between human activities and human habitats in urban settings. Explores the ways city dwellers understand and interact with urban and peri-urban habitats. Surveys the intersections between people and place in cities from an ethnoecological perspective to inform and contribute to initiatives to create sustainable cities. Prerequisites: ES 200; and minimum third-year standing. Theories concerning the relationship of human groups, culture and environment; cultural systems as the means by which human populations adapt to their environments. ES 301 or ES 321. Documents the evolution of human civilization through the lens of wine, chronicles the transition from mysticism to industrial global commoditization. Workshops examine terroir, varietal, age, price, quality and value of viticulture and oenological traditions from around the world, and what "sustainability" means in this context. The origins, theory and design methods of permaculture. Examines foundational texts that have influenced the development of permaculture, as well as contemporary permaculture texts. Critical examination of a range of designs and applications, including food systems, water systems, energy systems, appropriate technologies, place making, and the built environment. An advanced investigation into the meaning, limits, and significance of ecological restoration, including: how restoration is defined and why clear definitions are important; the role of historical knowledge in restoration; the changing character of restoration in a technological culture; ethical issues in restoration practice; participation and political process; cultural inclusion and the significance of restoration as a cultural mode; the international scope of restoration; and the paradox of design. Prerequisites: 341, ER 311; or permission of the School. Discusses the physical science behind climate change, and examines the challenges a changing climate poses for ecology and conservation biology research and management, including ecological restoration. Attention will be given to reading scientific papers that describe the mechanisms of global climate change, future climate scenarios, and effects on populations and communities of species in Canada and around the globe. Note: Credit will be granted for only one of 443, 482 (if 482 taken in Spring 2010). Discusses responsible intervention in ecosystems undergoing rapid change, covering a wide range of contemporary issues from barcoding biodiversity to rewilding, all with the aim of pushing against boundaries of received knowledge about preservation, conservation and restoration of nature. Prerequisites: ES 200 and ES 341. A practical examination of sustainable fisheries from a variety of interdisciplinary perspectives. Examines sustainability issues for fisheries and aquaculture through an integrated study of fish biology/ecology, oceanography, hydrology, environmental impact assessment, natural resource management and environment and land use planning. Prerequisites: 200 or 300A, and one of 321 or 341. An introduction to the objectives, philosophy, concepts, methods and social implications of environmental impact assessment (E.I.A.). A critical examination of E.I.A. as an analytical tool in the context of resource management and public policy is undertaken. Advanced field-based study of environmental problems and solutions. Intended to be a more self-directed course where the student identifies a problem and designs the process to implement solutions. Typically offered in a compressed format. Additional fees may be necessary to support field expenses. Compressed format field study focused on regenerative and restorative designs for ecological and social resilience. Offered in partnership with the Galiano Conservancy Association with field portion based on Galiano Island. Additional fees are necessary to support field expenses. An advanced practical study of permaculture principles in an intensive field-based setting. Focus on implementing concepts and practicing skills introduced in ES 433. A focused, in-depth systematic examination of specific environmental areas through seminars and projects; the development of appropriate responses to questions and problems within the selected areas; modes of interaction and communication with professional and community groups; application of theory to practice; and qualitative vs. quantitative research methods. These courses will be conducted as seminars and may include a field trip for which a fee will be charged. Prerequisites: 200 or 300A and 321. A focused, in-depth systematic examination of specific environmental areas through seminars and projects; the development of appropriate responses to questions and problems within the selected areas; modes of interaction and communication with professional and community groups; application of theory to practice; qualitative vs. quantitative research methods. Prerequisites: 200 or 300A and 341. Individual studies on approved environmental topics undertaken by students in consultation with faculty members. Projects will be supervised by one or more faculty members designated by the Director. Note: Restricted to students taking a major or minor in Environmental Studies. May be taken more than once for credit to a maximum of 3 credits. Prerequisites: 200 or 300A, fourth-year standing with a sessional grade point average of 6.5, and permission of the Director.